And for a little while longer I can share the backs of several things. A good bit of what I’m working on will be in the Kaleidoscope Collections booth at Houston for Market and Festival. Once Market starts the beauty of the front will be revealed. I can say with absolute certainty that Jeanie is amazing and I’m enchanted. If you know the Kaleidoscope Kreator you know the possibilities are unlimited and the color choices are well worth exploring. If you can see the symmetrical motifs in the blocks those are the kaleidoscopes. 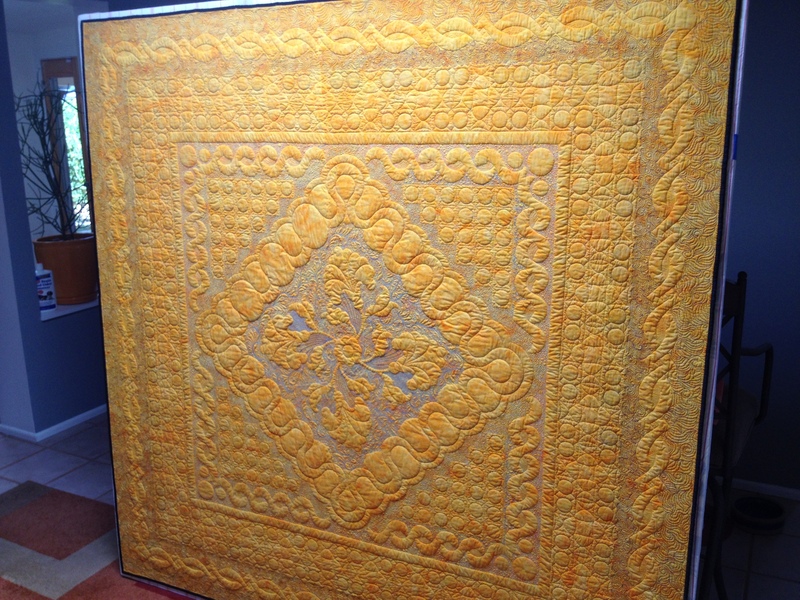 Each one allows for some amazing quilting. 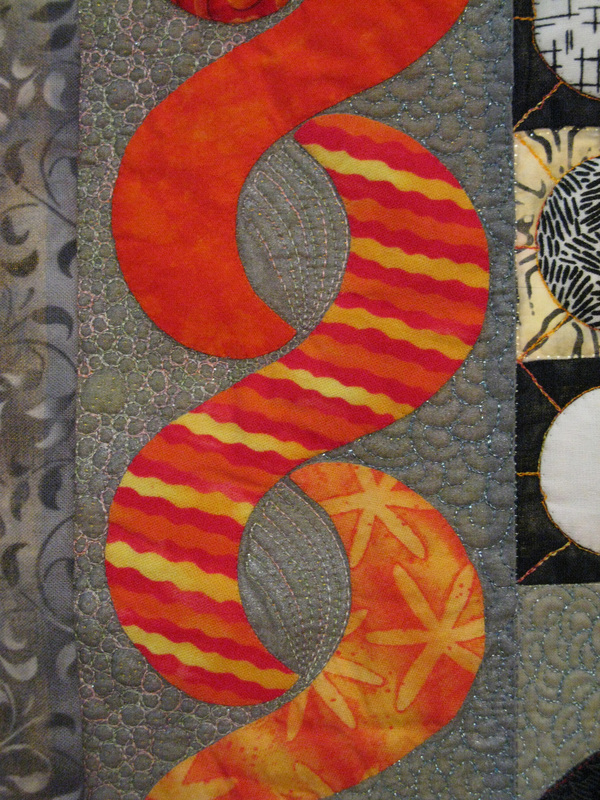 I’ve given a few sneak peaks of “Tilde” the quilt I’ve been working on with Keith Dommer. It’s now in Portland and will soon be in the hands of the judges and hung for all to see. In a sense it’s kind of freeing to send one of my quilts out into the world to see the joy (or not) that it brings to quilters. Like most quilters frequently I see what I consider to be the flaws. I know where they are cause I made them. Maybe they aren’t flaws as much as character builders and learning experiences. A moment when the character gives way to something that even I can appreciate. Sometimes it’s not quite what I expected either. 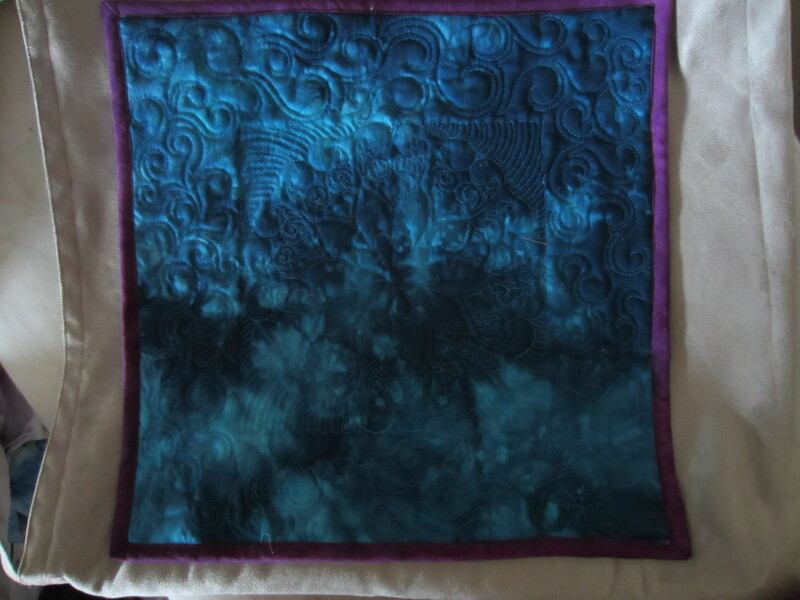 When I started quilting “Tilde” my intention was to use one particular color of MasterPiece on the back. I still have bobbins wound from this exercise in futility in my world. 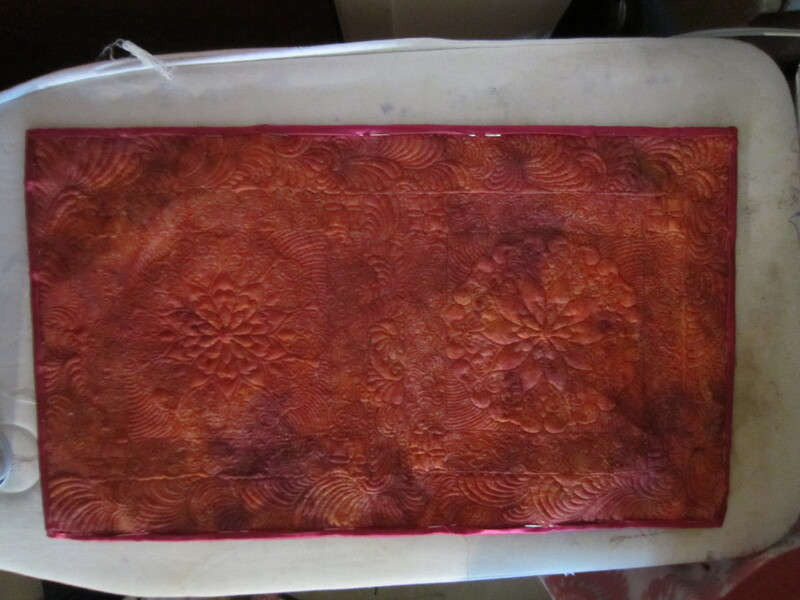 This quilt reinforced what I new already, using cotton in the bobbin with certain specialty threads is not a good plan. Cotton by it’s very nature is kinda grabby so while my tension should have been balanced and I was using the right size needle and made sure the room wasn’t very humid etc, etc. frogging becomes an important part of the process. I do have a reputation for frogging quilts and I know that is something that will carry forward. It’s something I teach my students. If I don’t like something I prefer to change it color, texture, fiber type. Tilde will be in Portland. Ribbon or not, I am happy with this quilt. Keith is working on the next one. Tilde is beautiful. I am without words or breath. What an awesome work to view first thing in the morning. My husband had one word, “WOW!”. And is incredulous: that despite what I have been telling him for years: that you use a domestic machine, you really do. 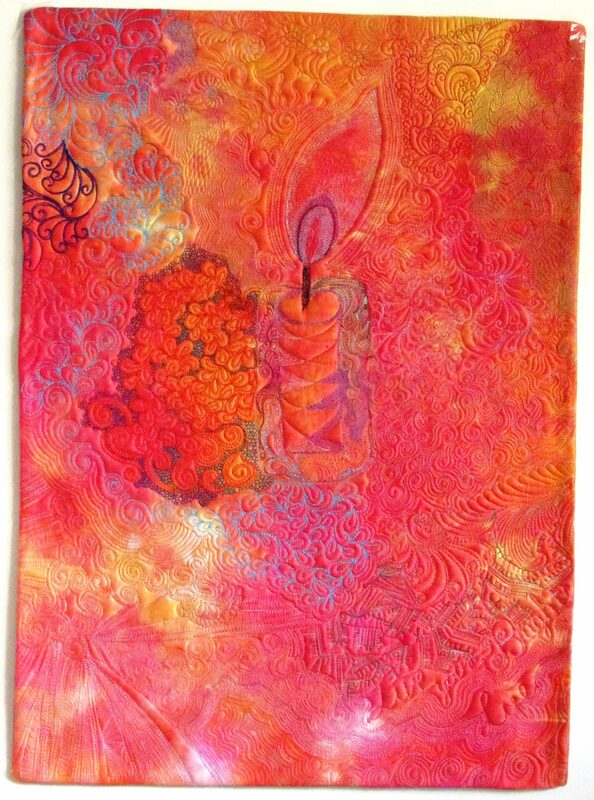 Teri, I can’teven fathom how you did this on your Bernina! How long did it take; did you bury your thread? You and Keith make an awesome team! Can’t wait to see the next masterpiece. 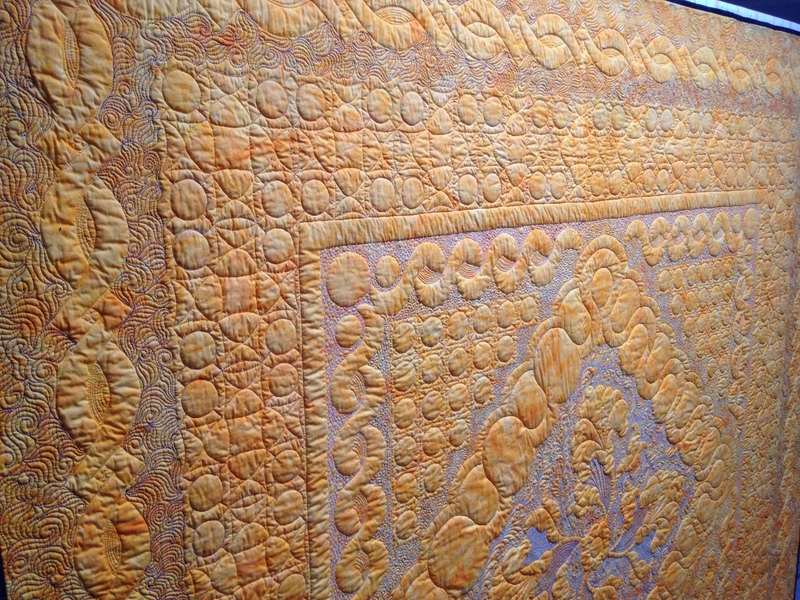 My jaw just dropped… My fiance asked me when am I going to sew a quilt like this one. Not in the near future for sure 🙂 It’s gorgeous and beautifully quilted, I can’t even find the words! You make beautiful quilts Kati. The lessons learned, there is no one size fits all!